"I need to digest your film, I hope you don't mind?" I hear myself saying this to the director and writer of one of the biggest red carpet premieres at this year's Abu Dhabi Film Festival. Sam Kadi is sitting across from me, asking me what I thought of his film, which screened the night before to a sold-out audience in the Emirates Palace theater. The film's basic synopsis tells the story of a Muslim Lebanese man who comes to NYC on a Green Card lottery visa, the day before the attacks on the World Trade Center. In fact, there are some films that leave you breathless at first sight and others that cover so many layers, have so much insight that it's simply impossible to stop thinking about them for days, weeks, perhaps months to come. 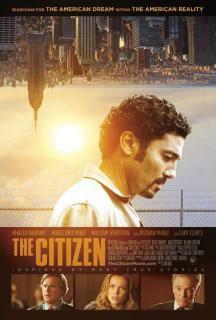 Sam Kadi's The Citizen, starring Egyptian superstar Khaled El Nabawy and American screen legend William Atherton is a film that belongs to this latter category -- the kind of movie that fills your day thoughts and colors your dreams for a long time after viewing it. Perhaps the greatest quality of Kadi's film is that at first glance it may appear to give another insight into the mistreatment of Muslims in America after 9/11, yet soon enough the viewer discovers it's actually not that simple. Beyond the initial premise, The Citizen is a film tribute to a great country, to our slightly dusty "American Dream" and an homage by one of its adoptive Arab sons to the land he loves. Kadi could be Ibrahim, his lead character, but the even finer point here is that we all should be. As the caramel-skinned, flawlessly handsome Nabawy says, in his kind, fluid English with just a hint of indefinable accent, "If you want love, love first" and as a film, The Citizen shows us the way. If somebody gives you something that really scares the hell out of you, you better think about doing it. "I was fascinated by my part in The Citizen, because I thought as an actor this is terrifying. I've got these two scenes -- and this why I did it -- I always think if somebody gives you something that really scares the hell out of you, you better really think about doing it. Because it's probably useful." "I play a person that could be a cold bureaucrat, there is coldness to him but I wanted to also portray the panic of the time, the worry of the time, the great uncertainty people had, I mean I lived in NY for twenty years, very close to the World Trade Center, this was my world, my neighborhood. What Sam had written was great, I wanted to give a seasoned, justified, questioning difficult argument. That a person, an ordinary American would feel he was being taken care of." He also poignantly supplies a spot-on insight into what it means to be an American : "I think one of the reasons American films have always been so popular is because America is a nation of immigrants. It's everybody and so there is a kind of humanity that happens because all of humanity is there." "Having been all over the world many different places, it's a very prosaic thing, but all you have to do to be an American is obey the law and pay your taxes. That's all you have to do. And like us. Americans always want people to like us. And if they don't like us, we get very upset and ask what did we do wrong? We'll always go back to what we did wrong... "
Guys we don't hate you at all but if you want me to love you, show me love first. Nabawy is one of the biggest stars in the Egyptian cinema firmament and yet he's also one of the easiest men to talk to about the Middle East, the West, humanity and the politics of the region. His approach to a solution is quite simple, instead of asking the typical question, "Why do they hate us? Do they hate our freedom?" he suggests love. Yes, love because "love has a magic key. If you're looking for love, love first. Love first and you will be loved. In 2001 a journalist from the Washington Post she came to Egypt to search about this, to ask many this question, why all of this hate? I said guys, we don't hate you at all but you want me to love you, show me love first. It is as simple as that." Typically soft-spoken, sultry Nabawy adds that what attracted him to the role of Ibrahim was a part that finally could show the true Arab spirit, bypassing the cliches: "Sentimental, Arabs they are not... They are kind and they are not weak. They are strong. And this was a very thin line to deliver, that he has done nothing, he's in jail, but he doesn't feel he's guilty. But he will not beg to be, not beg for justice. This was very important." He also enlightens me on the place of Egyptian cinema, in the great scheme of things: "This is very important for me, always I say we know about the West more than they know about us. Egyptian cinema started just 11 months after the brothers Lumière in France, we were in Alexandria in 1896, brothers Lumière started in 1895, we started in 1896 in Alexandria with a guy called Mohamed Bayoumi. We were one of the very first four countries that started cinema. America with Griffith, Russia, France with the Lumière brothers and Egypt with Mohamed Bayoumi. Freedom of speech, freedom of religion and respecting the law -- the American way. "We had to discuss a lot, like is this the right way, is this religious, etc. We agreed that we should avoid the politics, that this is a real story and we can learn from it. We should take it and adopt it. The most important points are about expressing freedom of speech, freedom of religion and respecting the law and this is something everyone who lives in the United States enjoys." He continues: "On the other hand we are telling the Americans this movie is showing the other side of some of these innocent immigrants who came here by legal entry to the final state where they are to be granted citizenship and we should respect them." Most of us want to connect with someone we feel we know. "This is personal experience and from friends. When you start out, most of us want to connect with someone we feel we know, maybe feel more comfortable in communicating, talking to and for raising kids. But Ibrahim, he becomes really unique, he wasn't sure if he was the traditional guy or the unique guy, so he went traditional and normal and went after the girl that appears fine to him. Later though he figured it out -- you have to stick to your humanity and your heart and your love and forget about colors, where someone is from and language and that's what the movie is all about."